Whether you grow your own or get a great deal at the local farmers market, you don't have to use up all your valuable freezer space. Usually take 10-20 ears of corn per quart depending on size. I was able to pick a bushel basket full and had enough for 20 pints. Warm jars and clean lids. Husk corn and remove silk. Wash and rinse ears of corn. Cut and strip corn from cob into a large bowl. 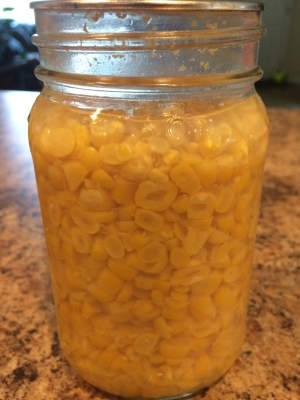 Pack corn loosly into your warm jars leaving 1 inch headspace (to the what I call the shoulder of the jar). Add salt to each jar of corn. Bring a large pot of water to a boil. Ladle the boiling water over the corn in each jar covering the corn up to 1 inch headspace. Remove air bubbles from each jar and wipe the rim. Process filled jars at 10 pounds of pressure for 55 minutes for pints or 1 hour and 25 minutes for quarts. Remove jars and let cool. Check lids for seal after 24 hours and reprocess any that may have not sealed.